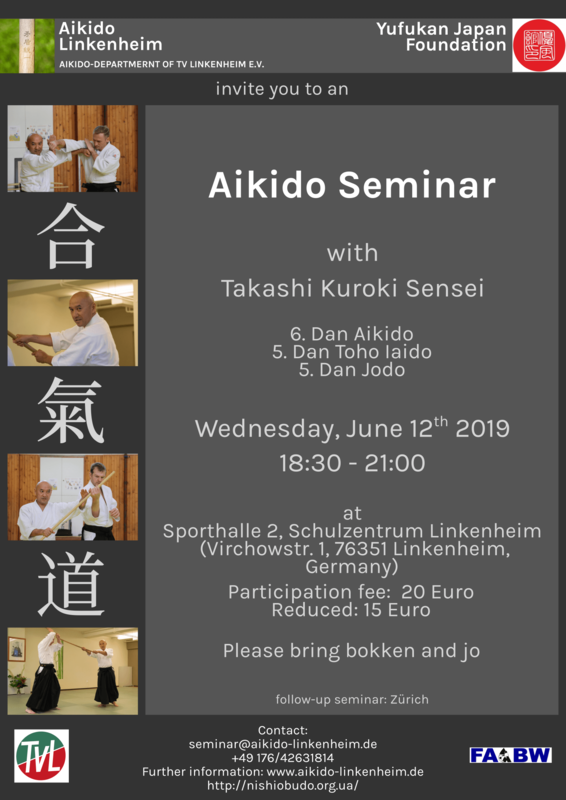 With great pleasure we are announcing the second Aikido seminar with Takashi Kuroki Sensei in Linkenheim, Germany. We’d like to invite you all to this opportunity to meet Kuroki-san and enjoy the seminar. Please get in touch with us if you’d also like to visit the follow-up seminar in Zürich (Thursday to Sunday). We might be able to offer transportation to Zürich. The seminar is open for all styles. Kuroki sensei teaches Aikido as it was developed by Shoji Nishio Sensei and further taught and develped by Koji Yoshida sensei. For a map of the seminar location please click here. The seminar poster in a pdf version can be found here. Wenn Du aus Versehen auf der englischen Seite gelandet bist, hier klicken für die deutsche Version.